The Process Multiple Files dialog box. The Process Multiple Files command applies settings to the images in a folder or a group of files. It allows you to apply identical adjustments to a group of images automatically. When processing files, you have the option to leave all the files open in the Editor, close and save the changes to the original files, or save modified versions of the files to a new location, which leaves the originals unchanged. Folder: Processes files in a folder that you specify. Import: Processes images from a digital camera or scanner that is currently attached to your computer. Opened Files: Processes all open files from the Editor. If there are no files open, this option is grayed out. 2 For Destination, press Browse and select a folder location for the processed files. Note that if you choose Folder as the destination, you have to specify a file-naming convention and select file compatibility options. 3 Under Image Size, select Resize Images if you want each processed file to be resized to a uniform size. To apply an automatic adjustment to the images, select an option from the menu in the top right corner of the dialog box. To attach a label to the images, choose an option from the Labels menu, and then customize the text, position, font, size, opacity, and color. 4 Press OK to process and save the files. A vignette is a decorative process where an image is intentionally faded toward the corners or edges. It can be used to focus a viewer’s attention toward the center of a photograph, or to cover unnecessary content at the edges. 1 From the Organizer, type holiday into the search text field to isolate the image you will use for this exercise. Right-click on holiday.jpg and select Edit with Photoshop Elements from the contextual menu that appears. 2 In the Editor, choose File > Save As. The Save As dialog box opens. 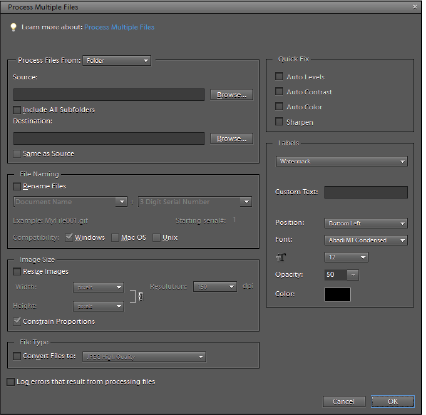 Change the filename to vignette and for the format, choose Photoshop. Press Save. 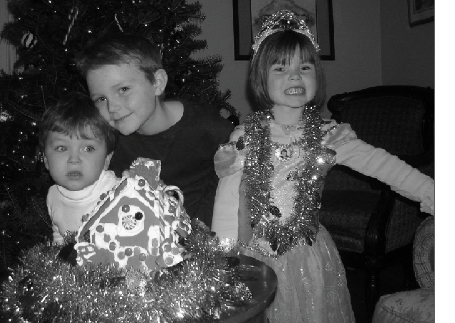 If a dialog box appears stating that Save in Version Set with Original is checked, press OK.
To add an interesting effect to this image, you will convert it to black and white, increase the contrast, and then vignette it to place emphasis on the faces of the children. 3 Choose Enhance > Adjust Color > Remove Color to convert the color image to black and white. Removing color from an image. The color has been removed from the image, but the resulting image doesn’t have much contrast. 4 Choose Enhance > Adjust Lighting > Levels. In the Input Levels section of the Levels dialog box, drag the black slider to the right until the number field below it reads 10. Drag the white slider to the left until the number field reads 215. Press OK. The Levels command is used to control the tonal values of an image. 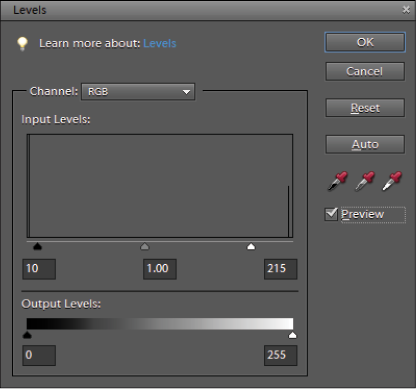 The Levels dialog box is used to control the tonal range of an image. 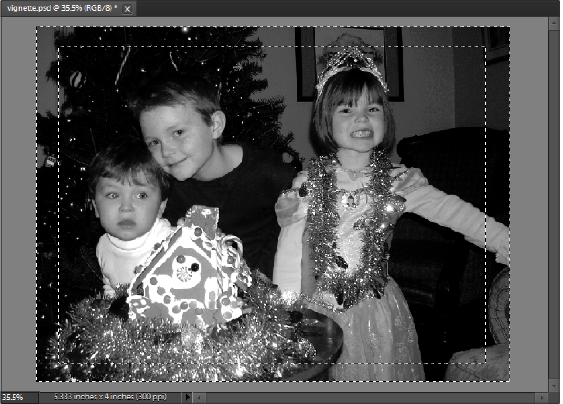 The Input sliders are used to set the minimum tonal value that you want to be black and white. As the sliders are dragged closer toward the center, more areas of your image are changed to black and white, thus increasing the contrast in the image. 5 Press D on your keyboard to set the foreground and background colors to the default black and white. Choose Filter > Distort > Diffuse Glow. In the Diffuse Glow Options dialog box, type 0 in the Graininess text field, 3 in the Glow Amount text field, and 14 in the Clear Amount text field. Press OK. The Diffuse Glow filter is used to add a glow to the highlight areas of an image. The glow color is set by the currently active background color of your document. 6 Choose the Rectangular Marquee tool ( ) from the Toolbox, then click and drag to draw a selection marquee around the entire image or type Ctrl+A (Windows) or Command+A (Mac OS) on your keyboard. The Rectangular Marquee tool makes rectangular selections. 7 For the vignette effect, you need to frame the image. With the Rectangular Marquee tool still selected, press and hold the Alt (Windows) or Option (Mac OS) key on the keyboard and draw a smaller selection inside the image. Holding down the Alt/Option key removes the new selection from the previous one. Holding down the Alt/Option key causes your new selection to be removed from the current one, while holding down the Shift key adds to the current selection. 8 Press the Create a New Layer button in the Layers panel. Double-click the name of the new layer and rename it Frame. 9 With the new Frame layer selected, hold down the Alt (Windows) or Option (Mac OS) key on the keyboard and press the Backspace key. This fills the selection with your current background color, which should be black. Press Ctrl+D (Windows) or Command+D (Mac OS) to deselect. To fill a layer or selection with the background color, the keyboard shortcut is Ctrl+backspace (Windows) or Command+Delete (Mac OS). 10 To create a vignette effect, you will soften the edge of the border. Make sure that the Frame layer is selected and choose Filter > Blur > Gaussian Blur. Type 40 in the Radius text field, and then press OK. Because the frame is on its own layer, the blur filter is only affecting the black border. 11 Choose File > Save or press Ctrl+S (Windows) or Command+S (Mac OS) to save the file, and then close the file. Most of the filters are accessible through the Filter menu. Certain filters are accessible all alone through their own dedicated control dialog boxes, while most automatically open the Filter Gallery. The Gallery allows you to apply a group of filters together simultaneously from a central location. Filters permanently change the image, and aside from using the Undo command, they cannot be changed after being applied and saved.